Connecting You To The Rest Of The World. We have built Distributed Antenna Systems (DAS) and Small Cells catering to Cellular providers for nearly 22+ years. We are not only fluent in their requirements but our lasting relationships help grow a strong partnership between them and you. We have supported some of the first projects on the newly created NFPA 72 chapter 24 and 1221 requirements along with the local State Fire Codes across the country. We have evolved with the jurisdictions, ensuring we help drive the results on behalf of our customers. We understand the magnitude and complexities of Small Cell/DAS programs and know how critical it is to minimize the risks of time-wasting problems we have multiple levels of quality assurance in place to ensure that our customers receive punctual and accurate results on every project. With demand for wireless services growing constantly, ensuring wireless service for your building, venue, campus, or business park is a must. Regardless of whether your particular needs dictate iDAS, oDAS, or Small Cell technology, Leaf has the right solution with the expertise to make sure it’s done properly. Leaf’s engineering and technical experts are trained in various network protocols, such as CDMA, PCS, GSM, iDEN, AWS, LTE and WiMax. We have decades of combined experience from start to finish. From planning to design, installation to testing and analysis, our experts will ensure a complete end-to-end solution that keeps your business moving and your investment working for you. Connecting You To The Future. 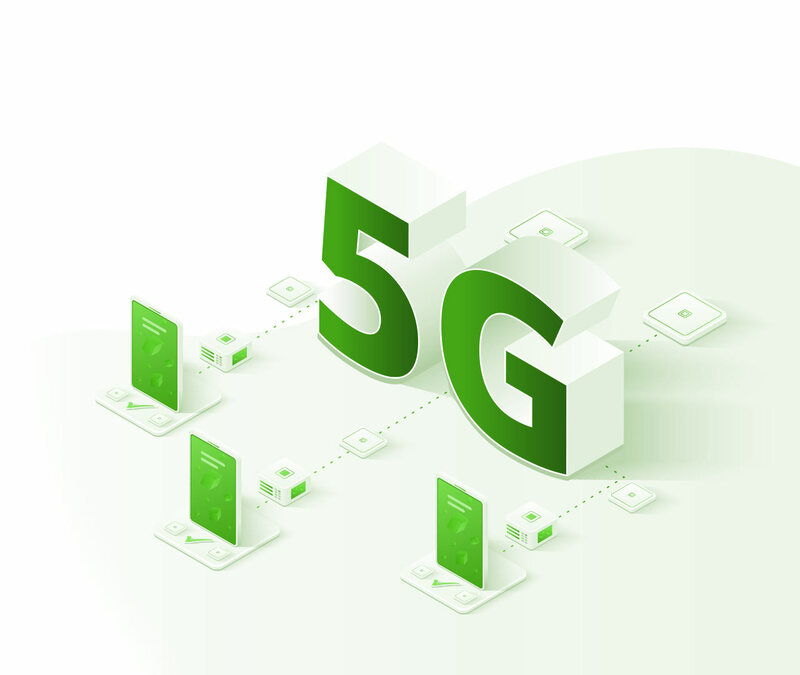 As we step into the fifth generation of technology, connectivity within the world is taking on a whole new dimension and 5G initiatives are beckoning our businesses into next level thinking. Our team of experts design, engineer, build, and install the wireless infrastructure that will support the latest in wireless technology. Because we are a turn-key operational company, we are able to take your project from start to finish while directly integrating with major carriers across the US. We are here to connect you to the globe and to the future. Start to finish, on time and on budget. Before the project even begins, we ensure you are set up for success by reducing time to completion and increasing efficiency. As your construction manager, we handle any necessary interfacing between labor, external contractors, planners, and even executive level leadership. Leaf Communications supports every job by, analyzing signal strengths, improving efficiency, and doctoring any refinements, upgrades, or equipment replacements. Design, planning and construction make up the multi-phased process to complete communications infrastructure. This process takes dedication and an expert team, like ours who are familiar with unpredictable obstacles and are able to fix problems before they ever arise. Whether NFPA 72, NFPA 1221, CFC 510, or other, We design build AHJ and code compliant systems all across the board. With code compliance in mind, we guarantee your systems acceptance. We are confident our team of specifically trained professionals handle all of your OEM and carrier equipment needs. Keeping them preforming at an optimal level. In the event of an emergency, your communications platform is critical. Our expert consultants can help you engineer, design, and test a complete communications topology that meets or exceeds NFPA® 72, IFC, or any other state adopted codes. Determining future needs can be a critical component when developing a public safety communications network. UHF, VHF, or a 700/800 MHz public safety service, the system’s future could depend upon careful planning and verification that all your signal strengths will be up to spec, even if the building is not yet complete. By reverse engineering current signal levels, Leaf can predict needs and develop a system that meets any necessary requirements. RF planning is one of the most vital points to hit in the very beginning of your project or it can be entirely compromised. We build all of our projects with this in mind. This is why over 90% of our clients trust us with their future projects. Complete Permitting Services for In-Building DAS, Macro/Micro Cell Sites and ROW Construction. Our experienced consultants will find, acquire, establish and maintain a cellular site that works for you. We provide in-house support for Architecture and Engineering drawings as well as full support for all engineering aspects of your project. This includes Full Build design drawings, Site Load Calculations, reverse engineering for signal strength needs, and much more. Our experts have performed site acquisition services many times all across the nation. Our complete set of site acquisition services combined with our full suite of consulting services for every phase of your project, truly sets us apart from the competition.